Thor returns to the big screen in Marvel’s second follow-up to 2012’s smash hit, The Avengers. Marvel Studios has kicked Phase Two of the Marvel Cinematic Universe into full gear this year, first with Iron Man 3, and now with a sequel to the surprisingly excellent Thor motion picture from 2011. While Thor: The Dark World continues the same unfortunate trend of movies having gritty and edgy sounding subtitles because, well, that’s what is popular and cool right now (I’m looking at you, J.J. Abrams), this Marvel movie hasn’t lost the wit, heart, and humor that has been a big part of the success of the Marvel Cinematic Universe thus far. That isn’t to say the movie is perfect. I won’t even say that it is as good overall as the first Thor movie, and certainly not in the same league as The Avengers. But this is a good popcorn movie, and it does ably continue plot threads from previous movies, while whetting our appetite for the inevitable Avengers 2. Most notably well executed, of course, is the continuing story of Loki. Loki, like the Norse god of mischief upon which this character is based, is someone who is easy to hate and love at the same time, and Tom Hiddleston has clearly hit his stride with this character and isn’t looking back. He is unpredictable, shifty, clever, conflicted, and just flat out entertaining to watch. When Loki seems to betray Thor in the movie’s final act, you can believe that it is real. I admit, I was sold on it, hook, line and sinker. It is a testament to how well this character is written and how well Hiddleston sells it. And, of course, Loki is layers of upon layers of duplicity, and actually does betray Thor in the end, after having pretended to betray Thor in a different way while simultaneously redeeming some of his lost honor. It is a joy to watch unfold onscreen. Unfortunately, outside of the Loki/Thor dynamic, the rest of the main plot is a bit of a mess. Christopher Eccleston, the Ninth Doctor, sadly has his talents go largely to waste here as the principal antagonist, Malekith. Malekith and the rest of the dark elves feel underwhelmingly developed and very derivative. They struck me as a very strange mixture of Tolkien elves and the Engineers from Prometheus. In fact the elves’ ships and technology feel almost directly lifted from Ridley Scott’s movie; the control rooms of the dark elf fighters in particular look almost exactly like the Engineer control room in Prometheus. It doesn’t really fit well with the rest of the movie and is an even larger departure from Norse mythology than the other denizens and technology of Marvel’s Nine Realms. Also a misfire is the love story between Thor and Natalie Portman‘s character, Jane Foster. Although it works for setting up some good comic material (such as the scene when Jane gets a phone call follow up from a previous date right in front of Thor), it never feels very believable. This I feel, is due not so much to a lack of acting skills (I know Natalie Portman’s acting is often derided; I personally have found her to be a competent actress when given good writing to work with), but just poor setup from the first Thor movie. That movie didn’t really give much time for the romance to develop believably; it is hard to imagine a several thousand year old demigod who is famous for his womanly conquests and his lust for life, would fall for a mortal after just a few days. On more of an upside, this reviewer loved seeing returning faces from the first Thor, especially Stellan Skarsgard’s Dr. Erik Selvig, and Darcy played by Kat Dennings. Dennings plays Darcy spot on with great comic timing, and I actually looked forward to every scene she was in. I loved seeing the fallout of Selvig’s experiences in The Avengers; I’ve heard some other critics chide the silly direction in which his character went, but he already had a hidden streak of goofiness that we saw in the first Thor. After being possessed by Loki in The Avengers, I would be surprised if the guy didn’t get a bit loopy afterward. 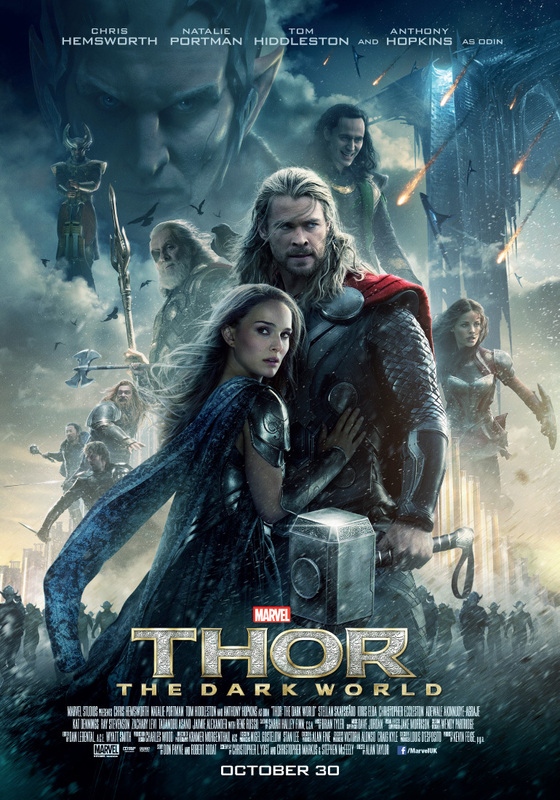 Overall, I found Thor: The Dark World to be a quite flawed but ultimately still greatly entertaining movie. While it is still a great departure from Norse mythology, this film did include more earthy, Viking influences in its art direction, which I appreciated, and I felt that this was a little more even-handed of a continuation of The Avengers than Iron Man 3. It certainly has a better ending by far. I give Thor: The Dark World a hearty recommendation for a theatrical viewing, and this reviewer will be adding the movie to his blu-ray collection when the time comes.